IFEA congratulates and welcomes new members, the Bangladesh Endodontic Society, the Chilean Endodontics Society, the Emirates Endodontic Society, the Hong Kong Endodontic Society and the Indonesian Endodontic Association. These associations were accepted as members of the Federation at the Board of Directors’ meeting on the 5th October, 2018, in Seoul, South Korea. Future IFEA World Endodontic Congresses. The 13th IFEA World Endodontic Congress will be hosted by the Argentine Endodontic Society in Buenos Aires, Argentina, in 2022. The 14th IFEA World Endodontic Congress will be hosted by the British Endodontic Society in Glasgow, Scotland, in 2024. The exact dates will be announced later. Congratulations is extended to both these associations. The Board of Directors has decided that the 15th IFEA World Endodontic Congress will be held in the Oceania Region in 2026. Member associations from that Region ( Australia, Indonesia, New Zealand, Philippines) are invited to bid to host the Congress. 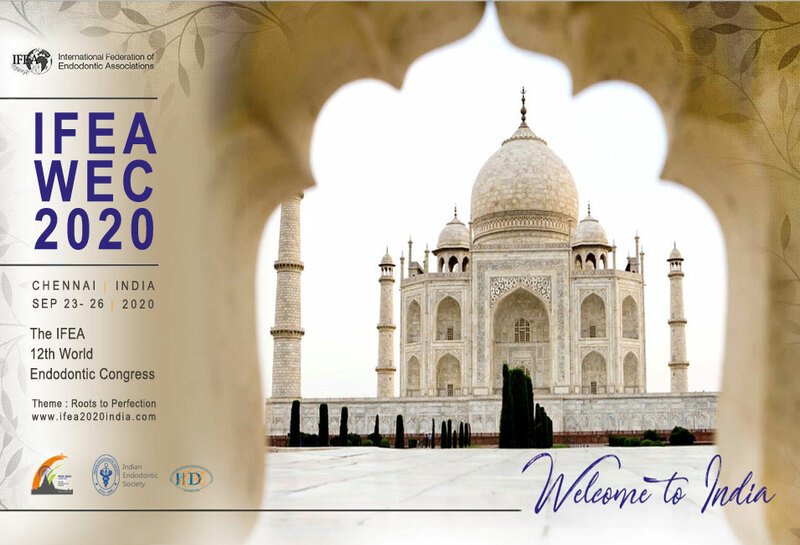 Bidding will occur at the AGM, during the 12th IFEA World Endodontic Congress, Chennai, India, September 23-26,2020. The closing date for the applications to be assessed, prior to the bidding, will be April 30th, 2020. Full details on the application process,including the guidelines for bidding and the criteria for the selection of Congress venues can be found here. The Board of Directors has decided that the 16th IFEA World Endodontic Congress will be held in the North America Region (Canada, USA, Mexico) in 2028. Bidding for this Congress will be undertaken at the 13th IFEA World Endodontic Congress in Buenos Aires, Argentina, in 2022. Members associations are reminded that their members can apply for this prestigous annual award. IFEA offers an IFEA Education Grant to eligible and successful applicants. Read the full document pertaining to the Grant and eligibility. for their support of the website in the future. Generic Meeting AgendaThe Annual General Meeting (General Assembly) will be held during the 19th Biennial ESE Congress, Vienna, 12-14 September, 2019.The specific date, time and venue is to be announced in due course. Welcome to the International Federation of Endodontic Associations. Our organization was created to promote fellowship amongst endodontists and their national endodontic associations, and to promote continuing education in endodontics throughout the world. IFEA is an international organization and membership is open to all national endodontic societies and associations in the world.